Self Portrait – Why the Long Face? The short answer is, “The paper made me do it.” It is oblong (approximately 5×8 inches). I had to fit my features within this constraint. I have also started wading into my new book, Paul Klee: Irony at Work, by Angela Lampe, Michael Baumgartner. There are a series of portraits at the beginning that captured my interest. My self portrait is an attempt to emulate these drawings. A somewhat more involved reason for the ‘long face’ is…. aging. There is gravity in this situation. Physical gravity and emotional gravity of getting longer in the tooth. 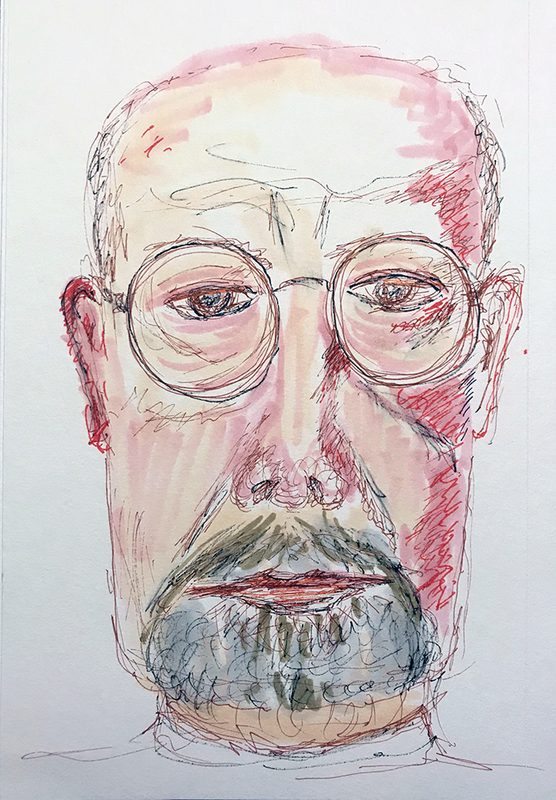 This entry was posted in Personal Stories and tagged artistic process, creative process, creativity, drawing, Paul Klee, pen and ink, portraiture, self portrait, sketching, visual arts. Bookmark the permalink.